When he retired in 1993, Gideon Rossouw had 19 years of service as a faculty member in Anaesthesia. Gideon died on November 19, 2016 at the age of 86. Sandra Topham a staff member with Robarts-Imaging with nine years of service, died on November 25, 2016 at the age of 54. Lovingly remembered by daughter Evelyn Topham (Robin), Evelyn’s father Tim Topham (Nina), parents Anne Longfield-Beaton (Wayne) and Bob Noble (Marg), sisters Kim Grayson (Henry) and Barb Debbert (Gord), and step-sister Deb Froats (Paul). Sadly missed by Marilyn Topham (late Bruce), Jeff Topham (Judy), and Patti Davis (Dave). Survived by many aunts, uncles, cousins, nieces and nephews. She left us too soon. Visitation on Thursday from 2-4 and 7-9 pm at Harris Funeral Home, 220 St. James St. at Richmond, where the funeral service will be conducted on Friday, December 2 at 11 am. Interment Woodland Cemetery. Memorial contributions to the Canadian Mental Health Association would be appreciated. When she retired from Western in 1993, Joan Sutter had 18 years of service as a staff member in Microbiology & Immunology. She died on November 19, 2016 at the age of 87. Professor Emerita, Sharon Haggerty died on October 11, 2016 at the age of 75. She had 21 years of service in Western's Faculty of Education. Sharon worked tirelessly towards the causes of gender equity in the sciences and public education reform, touching the lives of thousands. She is survived by her sister Linda, children Braden, Meg and John, and grandsons Samuel, Ivo, Declan and Luca. Sharon battled cancer related complications and made the brave decision to pass away on her own terms with family by her side. Gardening, reading, recycling, CBC Radio and genealogy were her favourite pastimes. Sharon a mother, a daughter, aunt, professor and friend will be missed greatly. Retired Zoology staff member, Alex Sangster died on October 20 at the age of 91. Prior to his retirement in 1990, Alex had 16 years of service at Western. Marge Moulton, a retired Faculty member from Zoology, died on Oct. 11, 2016 at the age of 86. Prior to her retirement in 1990, Marge had 28 years of service at Western. Beloved wife of the late Reuben Earle Moulton (2015). Loving mother of Jennifer (Bobby) Crigger, Elizabeth "Liz" (Ryan) Mercer, Earleen (Scott Moody) Moulton, Charles "Chuck" Moulton. Mother- in- law of Tracy Moulton. Cherished grandmother of Brenden and Ethan Mercer, Donovan Moody and Sam and Abby Moulton. Dear sister of Keith (Shirley) Prouse, John (late Emma Jean) Prouse, Janet (Arnold) Belore, Carole (Gordon) Moulton, Valerie (Andy) VanRyswyck and sister-in-law of Shirley Prouse, as well as several nieces, nephews and in-laws. Predeceased by her brothers, David Lorne Prouse, Irvin "Bun" (Bonnie) Prouse, and Garnett Prouse. Marge received her Masters Degree in Biology from the University of Western Ontario. When he retired in 2001, Frano Soce had 14 years of service at Western. Frano died on August 1, 2016 at the age of 80. Beloved husband of almost 50 years of Iva Soce. Loving Tata of Fra. Jago Soce, Robert Soce and Dijana Elrafih (Nidal). Proud Dida of Julius and Zayn Frano. Dear brother of Drago (Maria), Milan (Zdenka), Sima Milicevic and their families. Dear cousin of Marko and Bojka Dugandzic and their family. Frano will be fondly remembered by the Croatian Community and by the many friends he has made over the years. Stephen Concannon, a staff member in the University Machine Shop in the Faculty of Engineering, died on October 28, 2016 at the age of 52. He had three years of service at Western. Proud father of Amanda (James McGuire), Mitchell and Logan. Beloved brother of Malcolm (Lois) and Gillian (Alok). Loving uncle of Tej, Dane and Craig. Predeceased by his parents Joseph and Helen. Heather Laschinger, a Faculty member in the Department of Nursing, died on Oct. 29, 2016 at the age of 71. Dr. Laschinger had 29 years of service at Western at the time of her death. Professor Emeritus, Henry Barnett died on Oct. 20, 2016 at the age of 94. Professor Barnett had 18 years of service when he retired from Clinical Neurological Sciences in 1987, although he did continue to work well past this retirement date. Retired Western Libraries staff member Kerry Ferris died on September 20, 2016 at the age of 67. When she retired in 2014, Kerry had 30 years of service at Western. When he retired as staff member from Hospitality Services in 1999, Gary Klein had 22 years of service at Western. Gary died on June 26, 2016 at the age of 81. Jim Collard, a retired staff member from the Faculty of Engineering, died on Sept. 23, 2016 at the age of 67. Prior to his retirement in 2009, Jim had 20 years of service at Western. Best friend for 53 years and dearly beloved husband for 48 years of Marla. Loving Dad of Steve and his wife Dina, and Bob and his wife Sonya. "Best Grandpa in the world" to his granddaughters Holly, Olivia, Julia and Addison. Dear son of his mother Shirley and loving brother of Bill and his wife Bette, and Tim and his wife Deb. Predeceased by his father Bill and his sister Kathy. Jim will be missed by his mother-in-law Grace, his brother-in-law Randy and his wife Marie, as well as his nieces, nephews, and many cousins. Prior to working at Western, Jim served as a proud member of the Canadian Armed Forces for 22 years. He cheered hard for the Toronto Maple Leafs, the Toronto Blue Jays and the London Knights. He loved to golf, loved his dog Marley, and will be sorely missed by his many friends. We would like to express our deep appreciation to Dr. Khan and the nurses on the Palliative Care Unit at Parkwood Hospital for their wonderful care of Jim and our family. You are truly angels in our eyes and we thank you with all our hearts. Friends will be received on Tuesday, September 27, from 7-9pm at the EVANS FUNERAL HOME , 648 Hamilton Rd. (1 block East of Egerton). Funeral service will be held in the Evans Chapel on Wednesday, September 28, at 1 pm. Those who wish to make a donation in Jim's memory are asked to consider Parkwood Hospital Palliative Care, or the London Regional Cancer Program. Online condolences can be expressed at www.evansfh.ca A tree will be planted, by the Evans Funeral Home, as a living memorial to James Collard. Professor Emeritus, Donald McKellar from the Don Wright Faculty of Music died on August 28, 2016 at the age of 90. Professor McKellar was a former Associate Dean, with 33 years of service when he retired in 1991. He was predeceased by his parents Dr. Hugh Ellar McKellar and Ellen Mary McKellar (Andrews), his first wife Wesanne (née Anderson), second wife Judy (Nancekivell), daughter Ellen Mary and brother Ian. He will be lovingly remembered by his children Laura Jean McCann (partner Allan Leitch) of Thorndale, Donald Ellar McKellar (partner Kathleen MacDonald) of Vancouver, grandchildren Wesdon McCann (husband Gabe Traczuk), Laran McCann, Andrew McKellar, Colin and Kate MacDonald McKellar, and sister Jean Dollar (husband John) in London. Retired Facilities Management staff member Ron Brewe died on August 21, 2016 at the age of 81. Prior to his retirement Ron had 27 years of service. Anatomy Professor Bob Buck had 41 years of service at Western when he retired in 1989. Bob died on August 11, 2016 at the age of 92. Bob will be missed by his loving daughter Lucy Buck, grandson Alexander (St. Catharines), sister Janet Rhodes (in England), brother T. James Buck and his wife Corry, sister-in-law Linda Buck and many nieces and nephews. His loving wife, Carol died in 2004. He is also predeceased by his daughter Effie (1993) his brothers Conrad (1963) and Thomas J. Buck (2013) and sister-in-law Joan Buck (Pennsylvania). Bob was the son of the late Charles S. Buck and Beatrice Buck. 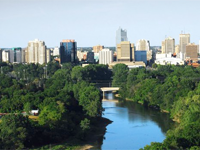 Bob was born and grew up in London, Ontario. He studied medicine at the University of Western Ontario and did most of his postgraduate work in England. When returning to Canada he accepted a faculty position at Western in the Department of Anatomy where he remained for the next 41 years. During this time he rose to professor and also served a term as Chairman of the department. His interest and teaching centred on histology and his research proceeded from the early days of electron microscopy. He published about 60 scientific papers describing the work done by him or in collaboration with his many graduate students. In retirement he gave full play to his hobby which was canoe building, constructing 8 canoes, both cedar strip and wood-canvas. Cremation has taken place. As Bob requested there will be no funeral service. In lieu of flowers, memorial donations may be made to the Carol Buck Graduate Scholarship, at Western University; attention Kendra Lealess, Western University, Westminster Hall, Suite 110, 1151 Richmond St. London, ON N6A 3K7 (cheques payable to Western University), by calling 519-661-4200 or online at www.westernconnect.ca/tribute A. MILLARD GEORGE FUNERAL HOME 519-433-5184 entrusted with arrangements. Professor Bill Nediger a retired faculty member from the Faculty of Education and former Registrar died on August 2, 2016, at the age of 83. Prior to his retirement in 1988, Bill had 23 years of service at Western. Husband of Phyllis (née Hanly), father of Bill (Dale Yoshida), Charlotte (Ivars Taurins) and Jennifer (Deane Patterson), grandfather of Larissa, Liam, Christopher, Will, Madeleine, Samuel, and Midori. Brother of Jean (Bill Hanly, 2015) and the late Betty Lou (Doug Bundy). A native of Clinton, ON, Bill was a lifelong educator, first as a schoolteacher in Huron County, and then as professor at the University of Western Ontario. Over the course of his career he taught at all levels, from Grade 2 to post-graduate. Administrative posts included Registrar and Associate Dean at Althouse College, Registrar of UWO, and Director of the Leadership Centre (Althouse). Among his many interests was a passion for woodworking (from furniture to musical instruments) and for carving ducks and birds. Family members vacation at the log cottage he built in the Almaguin Highlands and paddle Eagle Lake in the canoes he constructed. As requested by the deceased, there will be no funeral. The family will gather privately to celebrate his life. We extend our heartfelt appreciation to the staff of McCormick Home for their extraordinary care of Bill. Memorial donations can be made to McCormick Home, 2022 Kains Rd, London, ON M6K 0A8, or the Alzheimer Society, 435 Windermere Rd, London, ON N5X 2T1. When he retired from the Faculty of Engineering in 1985, staff member Everett Price had 13 years of service at Western. Everett died on June 29, 2016 at the age of 96. Professor Emeritus David Sparling, taught for seven years at the Ivey Business School. He died on on July 31, 2016 at the age of 64. David died of brain cancer. He was not ready to die and fought against it with every fibre of his being until the very end. He loved life and lived it to the fullest. His parents, Hamilton and Betty Sparling, raised their family, including Dave, his sister Lynn and brother Ron in the small town of Shawinigan, Quebec. Dave had so many fond memories of his childhood there and had an unlimited number of stories about the shenanigans that he and his lifelong friends got up to. He attended Queen's University and those were some of the happiest years of his life, largely because of the friends he made there. His Queen's buddies rallied around him during his fight against the disease, encouraging and supporting him. It was at Queen's that he met Jane Kersell. It was a case of love at first sight and they spent the next 44 years together. He never once forgot the anniversary of their first date and was an incredibly loving husband. They had four children whom he adored: Beth (David Lee), Laura (Jeff Newberry), Julie and Cameron. He brought so much fun and happiness to their lives and they always felt loved. He was thrilled to meet his two grandsons, George Lee and Hudson Newberry who gave him great joy in a very short period of time. Some of Dave's favourite moments were spent with his family at their cottage on Georgian Bay. Swimming, skiing, sailing, horsing around and the obligatory renovations kept Dave, Jane and the kids happy. His working life began on a farm in Cambridge where Dave operated a broiler chicken business. He soon became restless and returned to school, this time in business. He never looked back. He completed his PhD and began a career that filled him with joy and enthusiasm every day for the rest of his life. He was a Professor and Associate Dean at the University of Guelph before he was hired by the Ivey Business School at Western University. At Ivey, he was a Professor Emeritus and Chair of Agri-Food Innovation. He was an excellent teacher because of his passion for his subject and his keen interest in his students. He took the greatest pleasure from getting to know them and helping them achieve their goals. He was inspired by his colleagues at both Guelph and Ivey; his sparkling personality and fun-loving attitude enlivened both faculties. In addition to academia, he worked with government and industry in the Agri-Food sector and made significant contributions to both. He travelled the world teaching agri-business executives and operators of large-scale farms. He was in his element, loving every moment. Dave had a very sharp wit and was quick with a joke in any situation. He had the ability to make people laugh so hard it made their cheeks ache. Every party and event that he attended was more fun because he was there. His smile was infectious and his goal every day was to make someone else's day better. He had so many, many friends who stood by him over the last 22 months. Their kindness, generosity and unending support were a tribute to them and to him. Dave's death has taken some of the light and laughter out of the world. He will be missed by everyone who knew him but, especially, by his wife, Jane and his children whom he loved so much and who loved him. If you wish, donations may be made to the Juravinski or Princess Margaret Cancer Centres or to the David Sparling Scholarship Fund at the Ivey Business School. When he retired from Physics and Astronomy in 1987, Heinrch Walter had 14 years of service as a staff member at Western. Heinrich died on June 1, 2016 at the age of 92. Professor Emeritus from the Don Wright Faculty of Music, John McIntosh died on April 13, 2016 at the age of 83. John had 34 years of service at Western when he retired in 1997. Beloved husband of Diane Wangman McIntosh, dearly loved father of Kim Bloomfield (Andrew) and Kyle McIntosh (Jennifer). Cherished grandfather of Darian Bloomfield, and Natalie and Sydney McIntosh. Dear brother-in-law of Thomas and Susan Jadwin of Rochester, New York, and remembered fondly by numerous nieces, nephews and cousins in Canada and the United States. Originally from Simcoe, Ontario, John is predeceased by his parents Alice (Stuart) McIntosh Brockington and Russell McIntosh and his sister Mary Marson. John taught organ and music theory at Western University in London for 34 years, where he was loved and respected by many students. He was organist and choir master at St. James Westminster Anglican Church in London for 24 years. Other Ontario churches where John also served were Knox-Spadina and Humbercrest United in Toronto, and Knox Presbyterian Church in Goderich. He was a scholarly and accomplished organist who played many recitals in Canada and the United States. He was also privileged to have played a concert at Kings College Chapel in Cambridge, England and Paisley Abby in Scotland. Those wishing to make a donation in John's memory are asked to consider the Music Scholarship Fund at Western, the Canadian Cancer Society and Knox Presbyterian Church in Goderich. Jane Hollier, a retired staff member from Physiology, died on April 11, 2016 at the age of 88. When she retired in 1992, Jane had 15 years of service at Western. Jane is survived by her loving family: daughter, Leslie Stewart (Kevin), son, Peter Hollier (Heather), four grandchildren, Neill Stewart, Colin Stewart (Sohni), Nicholas Hollier, Kristen Liddell (Christopher), and two great-grandchildren, Brogan and Archer. Jane will be lovingly remembered by her sister, Nancy Giem, sister-in-law, Audrey Neill, and her nieces and nephews. She was predeceased by her husband, Bill Hollier, her parents, Millard Lincoln and Margaret Eleanor (Vallance) Neill, brother, Tom Neill, and brother-in-law, Gilbert Giem. Jane was a longtime resident of London, Ontario, where she was a proud staff member of the Department of Physiology at Western University. She loved music and as a violinist she was a member of several orchestras in the London area, including the Woodstock Strings. According to Jane's wishes, cremation has taken place. A Celebration of Life gathering will take place at a later date. To honour Jane's memory, donations can be made to the Music Scholarship at Wilfrid Laurier University. In lieu of flowers, donations can be designated to this fund at www.wlu.ca/give/musicscholarship or may be arranged through the ERB & GOOD FAMILY FUNERAL HOME , 171 King Street S., Waterloo at www.erbgood.com or 519-745-8445. Former Dean, Professor Emeritus, Allen Pearson died June 6, 2016 at the age of 72. Dr. Pearson had 15 years of service with the Faculty of Education, when he retired in 2010. His many friends and colleagues were deeply saddened this week to learn that former Dean of Education Dr. Allen Pearson has died. Those who had seen him in recent months knew he was not well but his death earlier this week at his home here in London was nevertheless unexpected. Allen was one of the faculty’s longest-serving deans. He came to us in 1995 from the University of Alberta and served as dean until 2007. He continued as a full-time faculty member until his retirement in 2010, after which he was appointed professor emeritus and adjunct research professor, and continued to be actively involved at Western in a variety of ways. Indeed, one hardly knows where to begin in acknowledging Allen’s contributions to the Faculty of Education and to Western as a whole. Allen was a philosopher of education. He had degrees from Colgate and Cornell, and had been a Visiting Scholar at the University of London and at Harvard. As a member of the Policy Studies group in this faculty, even as dean, he taught the Social Foundations course in our BEd program. When the faculty decided that the practicum was a responsibility of all faculty members, Allen, along with the rest of us, accepted responsibility for teacher candidates and their associate teachers at a local school. By all accounts, he was a great success in the role. Many current faculty members were appointed during Allen’s tenure as dean, and many partnered with him in teaching BEd courses, graduate courses or PhD seminars, and served with him on graduate student committees. He is widely remembered as supportive and sound of judgment. Those who taught with him in particular will miss him deeply. One of Allen’s most significant accomplishments as dean was shepherding a proposal for a PhD program through the program development and approval processes. The establishment of the PhD in the mid-1990s fundamentally changed the future of the Faculty of Education and is surely one of Allen’s most significant legacies. Allen was widely known at Western as a dean who made significant contributions to the broader university community. When the University of Western Ontario Faculty Association (UWOFA) was first certified, Allen served with senior university administrators on the very first negotiating team. Despite the enormous number of hours negotiating teams must be prepared to spend, Allen served at least two more times – because he was a valued and respected negotiator, and because he believed in serving when and where he was needed. He was also active on Senate, chairing the Operations/Agenda Committee for a number of years. The dean of a faculty governed by the university, but which must also satisfy the requirements and expectations of local school boards, Ministry of Education and Ontario College of Teachers, must at times be able to manage somewhat competing interests. Allen navigated these waters well. Over the years of his tenure, the faculty’s relationships with local school boards were strengthened and deepened, another legacy that continues to help ensure the success and well-being of the faculty. One of Allen’s favourite associations, before and after retiring, was with Western’s Teaching Support Centre. Allen was appointed a Faculty Associate for the Scholarship of Teaching and Learning, and in that capacity worked to help faculty members across the university engage in scholarly work on their teaching. Allen was instrumental in helping to establish the Canadian Journal for the Scholarship of Teaching and Learning, which is housed here at Western, and served on its editorial board for five years. Allen was highly collegial, enjoying equally the company of faculty members and staff. He ate with faculty members in the lunch room every day, stepped outside every few hours for “fresh air” with a staff assistant and joined a few staff and faculty members who formed a group to practice and play recorder flutes. He was genuine, totally without pretension. All remember him not only for his intellect but also for his good nature, gentleness, kindness and humility. As for me, I had known Allen when we were both at the University of Alberta in the 1980s. There he taught philosophy of education and, for several years, served as Assistant Dean of Practicum. I took great pleasure at his retirement party here at Western in telling everyone that at the U of A he had been known only as ‘Al’ Pearson – a nickname, he had told me, he hated. Here in London, Allen lived downtown on Albert Street and I would occasionally see him at Starbucks. It was always a pleasure to catch up with his latest activities – sailing with family members off the Eastern Seaboard, fundraising for the NDP – he was never at a loss for something significant to do; he always had a smile and something funny to share. Anyone who knew Allen found his wit and sense of humour as sharp as his intellect. For this and so many other reasons, we will remember him with enormous fondness and great respect. Written by Margaret McNay, Associate Dean, Teacher Education, Faculty of Education. The flag will be lowered until 2:00 pm., June 14, 2016, in memory of Former Dean and Professor Emeritus, Dr. Allen Pearson. Fred Armstrong, a retired Faculty member from History, died on April 15, 2016 at the age of 90. Prior to his retirement in 1991, Professor Armstong had 28 years of service at Western. Born in Toronto, Ontario on March 27, 1926 to Dorothy Lillian (nee Goode) and Silas Henry Armstrong, long time Superintendent of Playgrounds for the City of Toronto. Attended Queen Victoria Public School, Parkdale Collegiate Institute, and received his B.A., M.A., and Ph.D. from the University of Toronto. Fred was a history professor at The University of Western Ontario from 1963 to 1991, where he specialized in 19th century Canadian political history, and urbanization. Fred published many scholarly and popular works and was the recipient of numerous awards, including: Fellow of the Royal Historical Society; the American Society for State and Local History’s Certificate of Commendation, and The Award of Merit; Western’s President’s Medal; and the Ontario Historical Society’s Cruikshank Gold Medal. Survived by his wife Joan (nee Biberovich) who, in his own words, gave him “a wonderful life.” Also survived by his children Dale, and Irene (Gintaras Uleckas), and granddaughter Simone. We would like to thank everyone who helped care for Fred these past months, particularly the staff at Highview Residences, and Dr. Chris Brymer. At his request there will be no service. Fred will be interred at Prospect Cemetery, Toronto. When he retired in 1989, Vinod Dave had 21 years of service as a staff member in Diagnostic Radiology and Nuclear Medicine. Vinod died in India on February 11, 2016 at the age of 82. Beverly Johnston, a retired Western Libraries staff member, died on August 7, 2015 at the age of 89. When she retired in 1987, Beverly had 20 years of service at Western. Loving wife of the late Bruce H. Johnston. Dear mother of K. Dale Johnston of Napean, Deanne Westgarth & her husband Gary and Paul & his wife Jessieall of London. Loving grandmother of Laura Sewell, Michael Sewell & his wife Adele, Michelle Westgarth, Geoffrey Westgarth, Matthew Johnston and Jennifer Gardner & her husband David and 3 great-grandchildren Corbin, Rachel, Amandamaya. Predeceased by her sister Ann Purcell and brother Donald Navin. Sadly missed by special niece Judy Sholdice and special friend Norm Seabrook. Friends who wish may make memorial donations to London Regional Cancer Centre. Online condolences www.loganfh.ca A tree will be planted as a living memorial to Beverly Johnston. When he retired from the Parking Services Office in 1996, Bill Deisley had 22 years of service at Western. Bill died on March 23, 2016 at the age of 84. In honour of Bill's memory the flag on UC tower was lowered on March 29, 2016. Nancy Kendall, a retired staff member from Student Development, died on February 23, 2016 at the age of 81. When she retired in 1998, Nancy had 30 years of service at Western. When he retired in 1989, Earth Sciences Professor Emeritus, Charles Carmichael had 37 years of service at Western. He died on April 19, 2015 at the age of 91. Devoted husband of the late Carman Marjorie Carmichael and dear friend of the late Mary McInroy. Loving father to Cydna, Calum (Theo de Bruyn), and Crista (Grant Hauer); beloved grandfather to Ryan, Imogen, Catriona and Rosalind; predeceased by his brother Leslie and parents Blanche McBane Carmichael and Charles McTaggart Carmichael. Charles was first a student and then a professor at Western University. He received a B.Sc. and M.Sc. in Physics and a PhD in Geophysics, completing his doctoral research at Imperial College in London, England. He proudly served Western as a professor in Earth Sciences, and as a member of the Senate and of the Board of Governors. In addition to his teaching career and his scientific research on the earth’s magnetism, Charles’ passion was history – local history of Lobo Township where his Scottish ancestors settled in the early 1820s and where he was born and lived his life – and personal history of the Carmichaels in Scotland prior to their immigrating to Canada. For nearly 40 years, Charles and Carman enjoyed a rich social life and a broad circle of friends through the London, Ontario chapter of the Royal Scottish Country Dance Society. The family extends their heartfelt gratitude to the University Hospital staff and medical teams who attended to Charles with exemplary care and compassion. The funeral service was conducted at MELVILLE UNITED CHURCH, on Monday, April 27, 2015. In lieu of flowers, donations to the London Health Sciences Foundation would be greatly appreciated. Dr. Quentin Rae-Grant had seven years of service at Western when he retired in 1994 as Chair of the Schulich School of Medicine and Dentistry – Department of Psychiatry. He passed away peacefully in the comfort of his own home on March 16, 2016. In honour of Dr. Quentin Rae-Grant the flag on UC tower was lowered on March 24, 2016. When he retired in 1991, Bob Wright had eight years of service at Western as a staff member in Faculty of Engineering's Machine Shop. He died on March 9, 2016 at the age of 86. The flag on UC tower was lowered in honour of the memory of Bob on March 12, 2016. David Spencer, a faculty member from Information and Media Studies, died on February 29, 2016 in London, Ontario. David had 28 years of service at Western. He is survived by his wife Judi, daughters Shara and Kyra Lynn, grandsons Sam and Nicholas, and his family, Douglas (Bud) Boughner, Larry Spencer, and Mike Spencer. He will be greatly missed by his friends, extended family, colleagues, students, and cats. After graduating from the Radio and Television Arts program at Ryerson Polytechnic Institute, he started his career as a radio journalist. David worked as an announcer, producer, and production manager in Montreal and Toronto before becoming a faculty member in the Radio Broadcasting Program at Humber College. A dedicated learner, David earned a Ph.D. in History and Philosophy from the University of Toronto, accepting an appointment on the faculty in the Graduate School of Journalism at The University of Western Ontario. While at Western, David served as Associate Dean, Acting Dean, and a founding member of the Faculty of Information and Media Studies (FIMS). He was promoted to Full Professor in 2002. In the course of his career, David published three books, served as the Head of the History Division of the Association for Education in Journalism and Mass Communications, and as the President of the American Journalism Historians Association. He was twice nominated for the prestigious Bank of Nova Scotia Teaching Award, served as a Director on the Board of the Gordon Sinclair Foundation, and as an editor of J-Source: The Canadian Journalism Project. A loss keenly felt, a colleague wrote: "he always spoke of his family with deep caring and pride, of his work with enthusiasm and excitement, and of the other rich corners of his life with an infectious pleasure and gratitude." Friends and colleagues have shared fond memories of his mentorship, kindness, humorous stories, and love of history. In addition to his academic career, David loved to share his passion for antique radios, gramophones, and vintage British sports cars. Thoughtful, encouraging, and kind, David was someone who not only saw injustice in the world, but actively did something to fix it, quietly, (and sometimes loudly), working to make the world a more peaceful, inclusive, and better place. To honour his legacy at Western and his love of nature, a tree will be planted on campus. Donations can be made to Animal Alert or the Children's Health Foundation - London in his memory in lieu of a service. Gary Burt a staff member with Ivey Business School, died on January 30, 2016 at the age of 63. Gary had 45 years of service at Western. Professor Emeritus, John Knight had 26 years of service as a faculty member in the Department of Economics at Western. John died on January 21, 2016 at the age of 67, following a nine month battle with cancer. He was born September 12, 1948 in Earlwood, NSW, Australia. Predeceased by his loving wife, Mary Therese (McGrane) (2008), and his parents, John Knight (1972) and Patricia Gloria (Haigh) Knight (1995). Loving brother to Patricia Dawn Gibb and Lynette Anne Rocca of NSW. Professor of Economics at the University of Western Ontario since 1987. Mentor and good friend to many, particularly, his students. John will be missed by his extended family, colleagues and friends world-wide. Memorial Mass will be held in the Chapel at Windermere on the Mount, 1486 Richmond Street, London, Ontario on Saturday, February 6, 2016 at 1:00 p.m. Memorial donations to http://convio.cancer.ca/goto/JohnKnight. Interment NSW, Australia. When she retired in 1999, Belvena Potts had 42 years of service as a staff member in the Department of Medicine at Western. Belvena died on January 26, 2016 at the age of 75 at St. Joseph's Hospice, Sarnia, ON. Belle was the loving mother of Carolyn Potts, and is remembered as "Gramma Belle" by her grandchildren Taylor and Justine Moore whom she absolutely adored. She is also fondly remembered by her sister Gwenith VanAcker (Rule) of Alymer, ON, and her sisters-in-law Shirley Kirkwood of Burlington ON and Marilyn MacRae of Burlington ON. Belle was predeceased by her former husband James "Jim" Brian Potts (2011), and her parents Cecil Fredrick Rayfield (1971) and Ethel Rayfield (Mars) (1984). Belle is also survived by her brother Ralph Rayfield of Chatham, ON. Belle enjoyed a long and fulfilling career at the University of Western Ontario, London, ON (Western University), which began in the Department of Continuing Education in 1957 and lasted until her retirement in 1999 from the Department of Medicine. During her more than 42 years at UWO, it was not uncommon to hear across the campus "Check with Belle Potts, she will know,"as she was renowned as a tremendous source of information. Belle was highly respected by both faculty and staff for her sense of professionalism and yet her kind heart always shone through when her advice was sought; she always made time for those who were in need. Belle constantly led by example and carried herself with poise whilst acting in the best interest of the University. Upon her retirement, Belle treasured her time in Bright's Grove. She loved spending time with her grandchildren, watching with pride as they grew into the young adults they are now. She enjoyed countless hours in her gardens and the quiet solitude of the lake shore. Belle will be deeply missed by all who knew and loved her. Cremation has taken place. A private wake will be held on Saturday, February 6, 2016 for friends and family; by invitation only. Arrangements entrusted to the McKENZIE & BLUNDY FUNERAL HOME & CREMATION CENTRE , 519-344-3131. As an expression of sympathy, friends who wish may send memorial donations to St. Joseph's Hospice, 475 N. Christina St., Sarnia, N7T 5W3 or Bluewater Health Palliative Care, 89 Norman St., Sarnia, N7T 6S3. Messages of condolence & memories may be left at www.mckenzieblundy.com. A tree will be planted in memory of Belvena Potts in the McKenzie & Blundy Memorial Forest. Dedication service Sunday, September 18th, 2016 at 2:00 p.m. at the Wawanosh Wetlands Conservation Area. Professor Emeritus, Joseph Cummins a retired Faculty member from the Department of Plant Sciences died on January 8, 2016 at the age of 82. Prior to his retirement in 1996, Professor Cummins had 23 years of service at Western. Joe passed away peacefully with family and friends present after a lengthy and courageous battle with cancer. Born in Whitefish, Montana to Harold and Catherine Cummins, Joe earned his Bachelor of Science in Horticulture with the help of scholarship awards. He was awarded his PhD in Cell Biology from the University of Wisconsin in 1962, and his postdoctoral research was completed at the University of Edinburgh in Scotland, the McArdle Laboratory for Cancer Research in Wisconsin, and the Karolinska Institute in Stockholm, Sweden. Prior to moving to London in 1972 to accept a faculty position at the University of Western Ontario, he taught genetics at Rutgers University and the University of Washington (Seattle). His research was in the area of cellular RNA and DNA in the cell cycle, in the 1970s and 80s his focus turned to the environment and the effects of pollution on genes. During his career he has been involved in a wide range of environmental issues related to mercury, asbestos, PCBs, pesticides, toxic waste, and genetic engineering. Professor Cummins is the author of more than 200 scientific and popular articles. At the University of Western Ontario, Joe was instrumental in starting and teaching a course on Environmental Toxicology, and he taught Advanced Genetics, Microbial Genetics, Human Genetics, Regulation of Gene Activity, and Cell Biology. In addition to teaching and research, Dr. Cummins dedicated much of his life and energy to environmental issues including the cleanup of Pottersburg Creek in Ontario as well as serving as an advisor to numerous environmental groups, including sitting on the board of Greenpeace. Dr. Cummins was well known and highly respected as a passionate advocate for mother earth. As a fearless and determined teacher, researcher and man of science Joe worked tirelessly to improve the quality of our water, air and crops and protect our planet from abuse. Many of his friends and colleagues knew him as "Mighty Joe Cummins" because of the passion and determination that he brought to his work and projects. Dr. Cummins' work is now done and our planet is a cleaner and better place to live thanks to his efforts and persistence. In the words of his nephew from Seattle he was a man of science with a heart for justice and equally brilliant, kind, courageous and empathetic. Joe's hobbies included tinkering with computers and enjoying nature's treasures through hiking and travel and he was an avid history buff. While in high school he distinguished himself as a championship wrestler and his opponents then and throughout his lifetime were no doubt overwhelmed by his competitive spirit. Joseph was a loving and proud father of his daughter Lili and is survived by Sisters Sonia, Polly, Dodi and Nora as well as many loving nieces and nephews living mostly in the Seattle-Tacoma area. Joe was predeceased by his brother Harold Jr. and by his beloved wife Katya. A memorial will be held at JOHN T. DONOHUE FUNERAL HOME , 362 Waterloo Street at King Street, on Sunday, January 17th. Visitation from 12:00 noon until the time of the memorial service at 1 o'clock. In lieu of flowers, please send donations to your favourite environmental group. The flag on the UC tower will be lowered on January 17, 2016 until 11:00 a.m. in memory of Professor Cummins. Sampo Paunonen, a Professor from the Department of Psychology died on December 29, 2015 at the age of 63. At the time of his death Sampo had 30 years of service at Western. Beloved husband of Raija and loving father of Ari. Dear brother of Anja of Finland, Keijo of Mexico, and the late Rita. He will be greatly missed by his nieces and nephews, and by his many friends and colleagues. Sam was a long-time member of the Psychology Department at Western University. Special thanks to the Nephrology team and the Dialysis Unit at University Hospital. Private cremation arrangements. Professor Emeritus, Geoffrey Pendrill, a retired faculty member from the former School of Library and Information Science died on Dec. 19, 2015 at the age of 92. Prior to his retirement in 1988, Geoffrey had 20 years of service at Western. Sadly missed by his beloved wife Margaret and his sons Richard (Linda), Robert (Susan) and his four grandchildren Elaine, Ian, Katherine and Matthew, of whom he was always very proud. Geoffrey and Margaret celebrated their 65th wedding anniversary in September 2015. Geoffrey was born in London, England in 1923, volunteered for the RAF in 1941 and then attended Emmanuel College, Cambridge and University College, London where he developed his life-long passion for languages. He later joined the staff of the Wellcome Historical Medical Library in London and was later appointed as Librarian of the Royal College of Physicians in Edinburgh. After a decade in Edinburgh, Geoffrey moved to the University of Sheffield where he lectured for several years in Medical History and Library Science. Geoffrey, Margaret and their two young sons emigrated to Canada in 1968 where he finished his career as Professor Emeritus at the School of Library and Information Science at Western in 1988. He could make any conversation interesting, yet always in a kind and caring way. A private cremation has taken place and an English oak tree will be planted in his memory. Geoffrey lived a long and fulfilling life thanks in part to the wonderful care received over the years at London Health Sciences, Byron Family Medical Centre and most recently, PeopleCare nursing home. Condolences may be left at www.londoncremation.com. Those wishing to make a donation in his memory are asked to consider London Health Sciences.